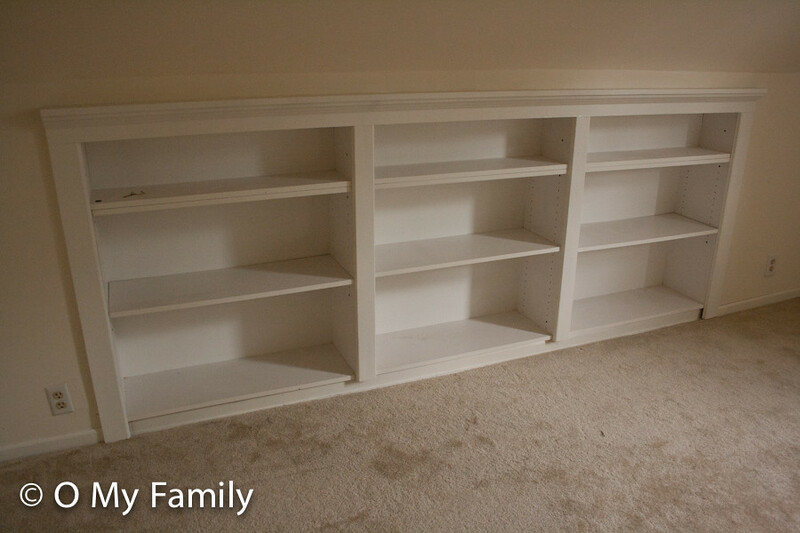 Posted by AllisonO & filed under House Projects, Our House, upstairs upgrade. This is the story of a 1930s house in an adorable little craftsman and tudor neighborhood who, unfortunately, had some not so nice owners once upon a time. So, we decided to rip everything out of the second story. What, did I skip a step in there? Please allow me to explain. Here’s the thing, friends. If you are going to be a do-it-yourselfer, especially on an older home, please, please for the love of all that is structurally sound, please do things the right way. I’m not saying you need to do things top of the line, do what fits your home’s price point, but when you undertake a project, follow standard procedure. Don’t cut corners. Don’t break city electrical codes. Don’t use the wrong materials. It’s so not worth it (not to mention illegal). This is was the second story of our house. Just an unsuspecting, plain, 2 bedroom 1/2 bath ho-hum area, no? Except, look closer. Do you see the gaps around every.single. joint? 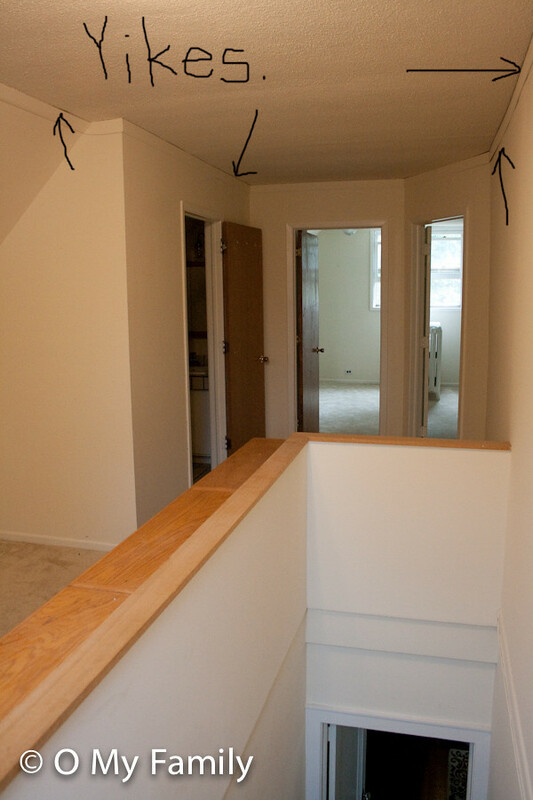 The strategically placed “crown molding” trim that’s supposed to distract from the fact that the ceiling is made out of foam and not sheetrock? And *knock knock*… you hear that? The sound of thick cardboard-like, paper-based material used for the walls? Being up there made me fear that if I huffed and I puffed (or sneezed too hard) I could have blown the walls down. I mean, sloppy work is one thing, cheap carpet is one thing, dated wood finishes is one thing, but cardboard walls? O for shame, previous homeowners. O for shame. They did throw in some nice perks amidst the gaping holes and inappropriate material choices, though. For example, they somehow rounded up every single oak modular bookshelf I ever used in the dorms at college and screwed them, side-by-side, securely to the wall. The real estate listing when we bought this house called this “built in bookshelves”. And now I’m just being sassy, but, are you serious with the leaf fossil tiles all over the bathroom? Like I said, outdated is outdated and it is the nature of the beast that is house renovations, so I’m not pointing any fingers over choices of finishes (hello, chrome faucet with plastic tear-drop handle). 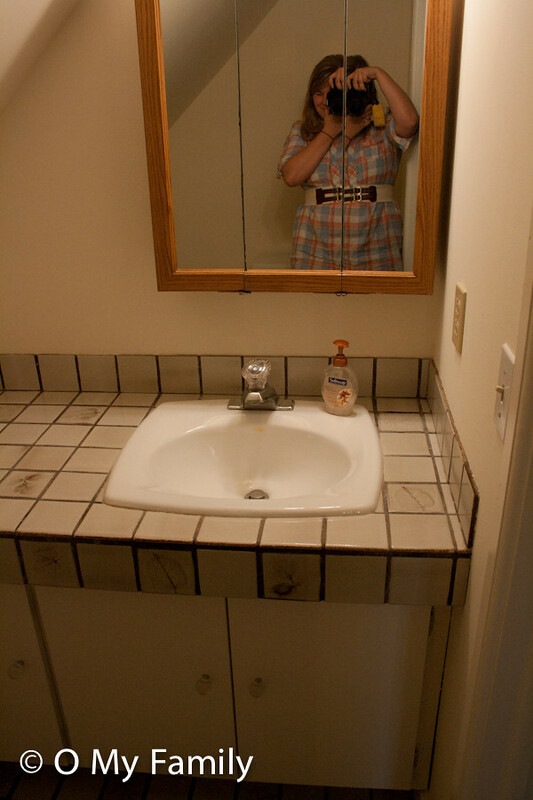 No, it’s the upside-down electrical outlet (which is in a different color than the light switch which is yet another different color than the light switch’s face plate ::facepalm::), the use of regular tiles as a back-splash (rough edges exposed around all borders), O, and more gaps (right side of the “vanity”). Ok, I suppose I should be nice. The screw-it-up do-it-yourselfing people who finished the upstairs (and I use the term ‘finished’ loosely) did do a couple of things nicely, like actual built-in shelves. 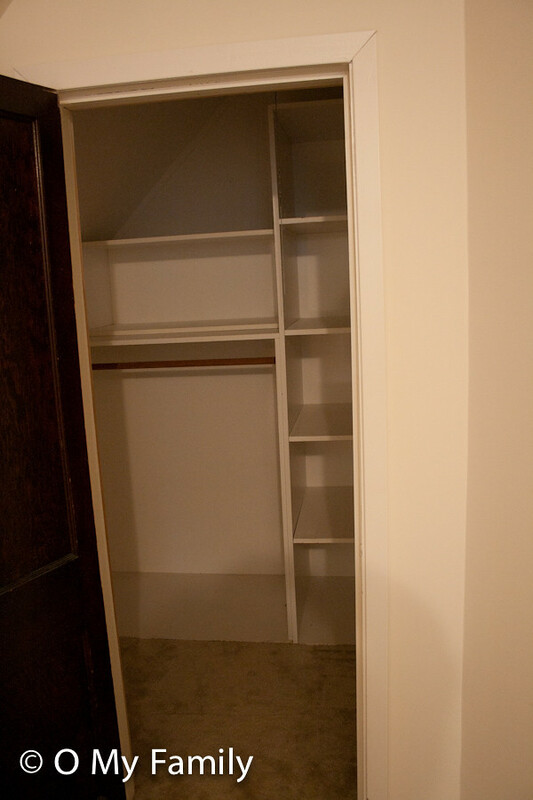 And a nicely organized closet in one of the bedrooms. 2 points to them for that. You should see our house! We have some things here too, that I’m like, WHAT WERE THE THINKING??!! I can’t wait to fix ours eventually. Looking forward to seeing the rest! Oh wow!!! Cant wait for this continuation! I can’t wait to see this come together! I can’t believe they used FOAM for the ceiling. O MY what were they thinking? Oh MAN. “Home renovations” at their worst! Can’t wait to see the end result, though! O boy! I can’t wait to see how it all turns out! So exciting! so excited to see how this turns out. i love remodels. and i love step-by-step teasers! i can’t wait to see how it turns out! props to you all for demolishing it! i wouldn’t have had the courage or the inspiration to buy something that i didn’t like, but you guys are proving that you can make anything gorgeous (from your downstairs that you’ve shown us). if only we all had mr. fix-its as our husbands or/and FILs :) only mildly jealous here! You are so brave! I can’t wait to see the finished product! you all could for REAL have your own show on HGTV. You all are sooooooo… crafty DIY-ers!!!!! I would be as nervous as crap to do something like this!!!! So, so brave. Preach it sister!I live in a 100yr old Sears Craftsmen home. Oh so much electrical had to be ripped out on the basement they finished/er didn’t finish and it seems like every other day we find something that was done cheaply, or a shortcut was taken. Thankfully nothing as huge as you, that we have found, yet. Just lots and lots of little tedious things that add up to time and money and irritation! Like apparently they didn’t have a ruler and everywhere molding is falling down b/c they didn’t use the right size nails or there is a gap around an outlet because they cut the the hole too big. It’s insane! Do it right or don’t do it! no way! my dad teaches building codes (he’s in the architecture dept.) and he would cringe. for serious. I think we covered this, but you and I live in parallel lives, at least as far as housing is concerned. Somewhere in out 100-year old Craftsman’s life, the owners finished half our top floor – badly. For example, when they needed an angled door to lead into the unfinished, uninsulated section under the eaves, did they buy an appropriate door? No ma’am, they did not. They just sawed the top off a $20 hollow-core. Beautiful work. Don’t get me started on what they called the “heating system”. I can’t wait to see your finished space! Nice. Sawing off the corner of a hollow door. -2493 points to them for that. You guys rock. As a former architectural designer, I get so excited when real-life people take on this kind of project. 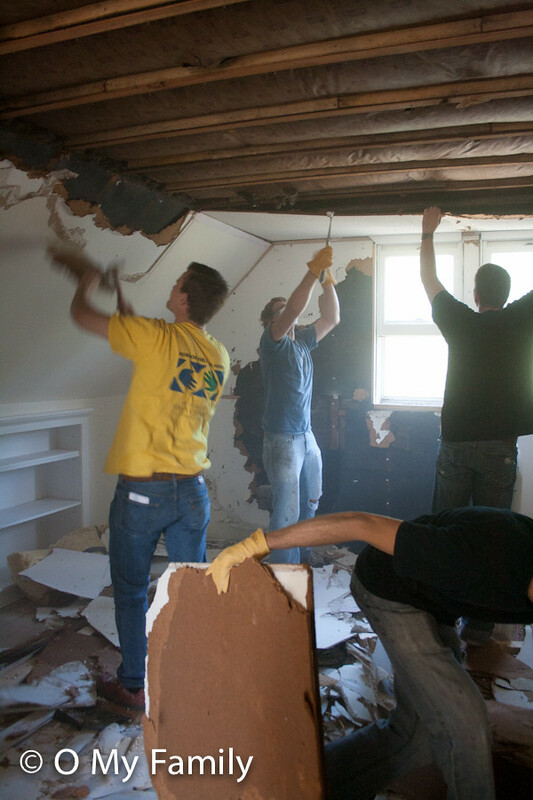 Knocking down walls, reconfiguring space – hard to get more exciting! Girl, you are brave. Bless your soul I can’t wait to see the finished product. We thought about it, but it would have been too much detail work to be worth it. 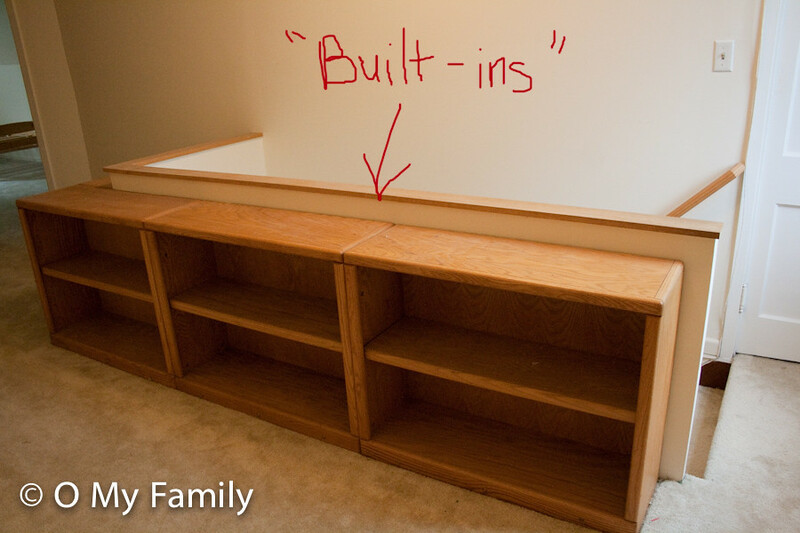 We do plan on putting in something very similar in the new hallway, though! What a challenge, sounds frustrating. Good luck with the remodel. It will be a lot of work but worth it in the end. we had / have some of the same issues. awfully awful previous owners. we thought the moulding was the only problem. seemed a bit … off. had no idea about the $30,000 worth of shtuff we’d have to do in order to LIVE IN THE HOUSE. seriously. we couldn’t live in more than 1/2 of our house (including the bathtub area – with kids!) until it was fixed. oh … and it looked off because there were THREE different trims. one for each side. gah. Now this I can’t wait to see! We have a TON of shaddy work in our house too, and are slowly correcting what the previous owners did. It takes time, but we want to make sure we do it right! Wow! I can’t wait to see the rest of your project. You guys are so brave! Wow! I love home renovation and can’t wait to see this space transformed. Following this story with interest…..signed, another homeowner of a dated, older home in MN…. You are my hero(s)! I guess the good thing is *most* of it is contained upstairs, right? I love (finished) home projects but emotionally don’t handle them well. My husband likes to remind, errr imitate, me reacting to him refinishing and painting the wood trim in our house while I was pregnant and very emotional. Y’all are brave! I can’t wait to see how it turns out! When we bought our 1923 home, we had planned on fixing it up and selling it eventually. At the time we had 1 kid and 1 on the way. Now, 4 years later, we have 3 kids in a 2 bedroom house that we still haven’t fixed up because there was so much more work to do than we thought and we just don’t have the money! 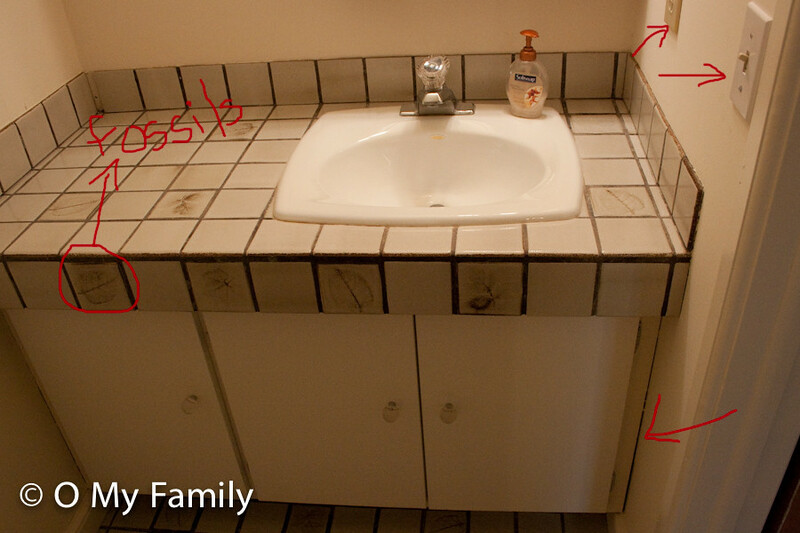 Lots of “what in the world was the guy thinking?” kinds of stuff, I mean, tile for the kitchen countertop? 2 vinyl windows at the front of the house that are horribly fitted and air blows through the sides!! Among other things……We’ve started doing some painting and there are a few other cosmetic things we are going to do, but we’ve decided we’re just going to try and sell it and find a 3 bedroom home. I still think it would be awesome if we could just add on to this place and stay here and just gradually fix it up(the artist in me coming out), but I don’t think that’s gonna happen. I hate to move though because we’ve always had great neighbors! My dad built the house I grew up in and installed all the electrical outlets “upside down” with the ground pin on top. (I put ” ” because I’m not 100% sure if the direction of the plug is part of code.) I ask him all the time why he did it, but of course, I never remember what he says. I did Google it once and someone explained that if something were to fall on the upside down plug, it would touch the ground pin first which would decrease the chance of an electrical fire. Now I live in a house with two-prong outlets, so I would take upside down three-prong outlets anyday! O, hi there. I’m Allison. o how I love these! © 2019 O My Family – This new mom's blog.